The Vocal Tuner can be used to correct out-of-tune vocals. It features two programs: Natural, which corrects pitch in a very unobtrusive manner, and Modern, which sounds a bit synthetic and robot-like. 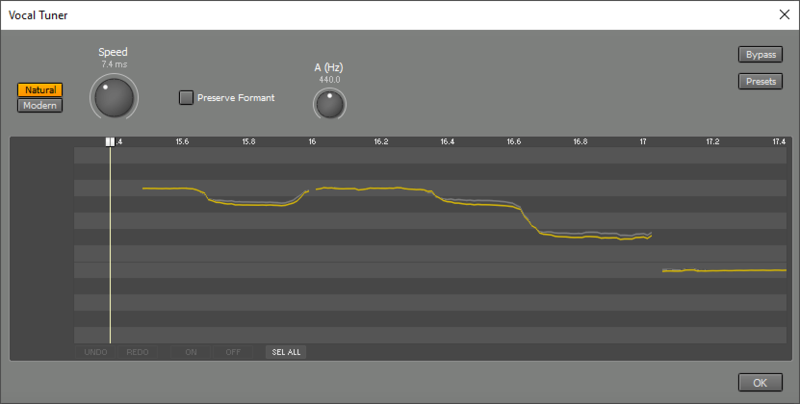 The Vocal Tuner is a mono effect, you can use it on a stereo track but the signal will be converted to mono. The Natural program works as unobtrusively as possible. The Speed knob sets the speed at which pitch is corrected. A slow setting leaves note onsets and vibrato intact. Preserve Formant corrects the formant so the results sound more natural. This isn't necessary if pitch is shifted by a small amount only. The Modern program sounds a bit synthetic and robot-like. This sound has become quite popular in recent years. The Correction knob sets the amount by which out-of-tune notes are corrected. At 100% pitch is perfect, which usually sounds rather synthetic. Lower settings allow for more natural sounds. The ignore section contains knobs that make the tuner ignore certain parts of the sound in order to avoid unwanted artifacts. Ambient ignores background noise during silent parts. Sibilant ignores unpitched sounds like "s". Note that the Vocal Tuner doesn't do anything if you turn an "ignore" knob up by too much. The key editor shows both the input pitch (dimmed color) and the output pitch (bright color). The Vocal Tuner quantizes pitch to the closest key. Using the key editor you can turn keys off for certain parts. If a key is off pitch is quantized to the closest key which is on. The Vocal Tuner doesn't do anything if all keys are off. The key editor looks like a one-octave pianoroll. You can select part of a horizontal bar that represents a key using the mouse, and use the ON or OFF buttons to switch the selected part on or off. Selecting multiple adjacent keys is possible as well. If it's more or less OK you can use a Vocal Tuner to add some polish, no editing required. If the vocals are really good but a few notes are off you can process just those notes. To do this you can click "SEL ALL" followed by "OFF" to turn all keys off. Then find the bad notes, select all 12 keys in those places and switch them on. 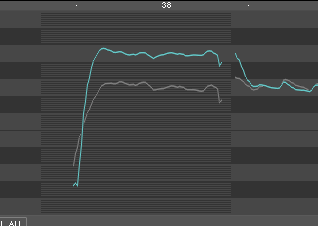 If the vocals are pretty bad the Vocal Tuner may quantize to the wrong notes. This can happen if, for example, an F is so low it's closer to E than to F. You can solve this by selecting the E key and turning it off. The Vocal Tuner can be used to change the melody. In the picture below all keys are off except A, so the G is turned into an A. Note: When used in an audio track the Vocal Tuner updates the key editor pitch curves even if the transport isn't running. It uses the track's audio file directly for this, so any effects preceding the Vocal Tuner aren't applied. For example: if an Automated Fader effect is used to mute a note the muted note will still be visible in the Vocal Tuner. Note: the Vocal Tuner only works if delay compensation is available. In short this means it doesn't work 'live' using Soft Monitoring.